(Bloomberg Opinion) -- While Hong Kong’s stock and bond investment pipes to mainland China get much attention, a third link between the financial center and the People’s Republic has largely flown under the radar. The hidden “connect” hooks up banking flows from the city with borrowers up north; it’s large, and growing fast. Left unchecked, it could weaken Hong Kong’s lenders. Fitch Ratings Ltd. analyst Sabine Bauer, who keeps a running tally of banks’ mainland exposure, is noticing more of Hong Kong lending being directed to Chinese financial firms and small and medium enterprises. Credit quality concerns may not be immediate, but they’re bobbing below the surface. It isn’t just the locally incorporated units of HSBC Holdings Plc, Standard Chartered Plc, Bank of China (Hong Kong) Ltd. or Bank of East Asia Ltd. rushing cheap Hong Kong deposits to mainland borrowers. 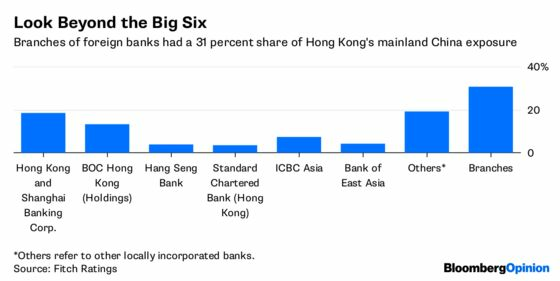 Increasingly, it’s the Hong Kong branches of Chinese banks that are scaling up home-country exposure. Since they’re branches, they can’t take retail deposits in the city. If they make lending mistakes, the ripples will be felt in China first – but could quickly travel to Hong Kong’s interbank market, where they participate. The Hong Kong Monetary Authority doesn't have many levers to pull – it can’t prescribe additional capital for foreign-bank branches that don’t hold any. A previous buildup of mainland exposure was a carry trade; borrowers in China bet on a rising yuan to repay dollar loans. That gamble ended with the 2015 devaluation. It’s hard to say what could damp the current enthusiasm. Interbank rates in the city are still half a percentage point below three-month dollar Libor of 2.3 percent. So there are plenty of in-built incentives for lenders in the city to use their connect pipes to flush excess liquidity to where it’s at a premium: China. 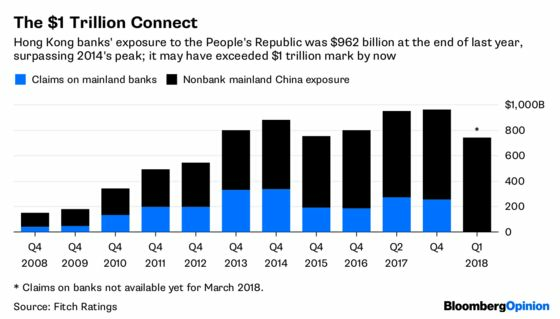 The interbank borrowing market there saw a 1.3 trillion yuan ($203 billion) decline last year, according to UBS Group AG, as President Xi Jinping choked off financing avenues for shadow banking activities. The longer interest rates in Hong Kong stay low, and the bolder Xi’s deleveraging campaign gets, the more tangled the city’s banks may find themselves with mainland borrowers. Hong Kong banks’ gross mainland exposure was about $950 billion in June last year, higher than 2014’s peak. Since then, loans to nonbank mainland customers, who account for almost three quarters of the total involvement, have risen 9 percent, Bauer’s data show. In other words, the northbound banking connect from Hong Kong may already have hit the $1 trillion mark. The monetary authority has responded to Fitch's concerns by drawing attention to a sub-1 percent rate of doubtful or bad loans in lenders' China books over the past five years. Underwriting standards are prudent, it says. Still, fast and furious doesn't always end well in banking. Most of the discussion about risks facing Hong Kong lenders concerns their local housing-loan business. As Bloomberg Intelligence analyst Francis Chan writes, mortgages could be “the least of the worries” given progressively stricter loan-to-value restrictions imposed by the monetary authority since 2009. Perhaps the regulator should be doing something similar with the banking connect now. The pipe is fat, and it’s gurgling too loudly.